I just ran across this post of facebook from Frugally Sustainable and the post was about a free e-magazine called City Cottage. The owners are founded in the UK but their subjects are close to most preppers hearts! Raising your own animals for food – I totally related to the author as she spoke about loading the pigs for the trip to the butcher. I hated the day when we loaded ours! It’s a catch 22 for me. I knew we were raising them for food but daily, they would run out when I fed them or watered them. They would… well, let’s not go down memory lane here. Anyway, the magazine is free and this last issue is 56 pages full of very useful information such as gardening tips, sewing, woodworking, baking, wine making, caring for chickens, etc. I found a ton of great information inside and wanted to pass it along to you! If you want to challenge yourself to the possibility that our mind is capable of seeing things beyond our reality, then you may be interested to watch the following video documentary which predicts (via ‘remote viewing’) a solar ‘killshot’ that will end it all, for many of us. Whether or not you are willing to let notions of remote-viewing or ‘esp’ into your consciousness, the scenario predicted within the video is a scientific possibility, one which we can do nothing to prevent. But, maybe, just maybe, we could do something to prepare for. Disclaimer: We have no affiliation or promotional motivations in any way with the person or information contained within or related to the video. Instead, I found it fascinating, and given the author’s credentials and apparent authority I thought some of you may appreciate it. Maybe it will motivate you to reinforce your preparedness plans, maybe it will simply start you to thinking about the ‘what if’, or maybe you will think it’s a bunch of hot air. The video ‘The Killshot’ by ‘Remote Viewing Products’, is in the public domain and is free for the viewing at their website (and others), while their DVD can also be had for free from their website (thekillshot.com and learnrv.com) – which is why I believe it to be within our right to post it here while at the same time providing fair credit to the source. Major Edward A. Dames, United States Army (ret. ), is a decorated military intelligence officer and an original member of the U.S. Army prototype remote viewing training program. He served as both training and operations officer for the U.S. government’s TOP SECRET psychic espionage unit (PSIINT). Major Dames has been awarded the Legion of Merit, and two Meritorious Service Medals. Major Dames retired from the U.S. Army in 1991 and began a full-time effort to advance remote viewing technology, and to create teams of professional civilian Remote Viewers to work on complex projects. He currently serves as executive director for the Matrix Intelligence Agency, a private consulting group. We’re not going to be hit by just one mega solar flare, but a series of them over time (perhaps over a 1-2 year period), “that’s going to turn Earth into a veritable X-ray & proton rotisserie,” he said. Locations in the southern hemisphere will have few survival zones, he said. If you aren’t in a safe haven, then living underground to avoid the high winds and dark skies, is your best option, he added. The Killshot is truly frightening but Ed doesn’t use this video as a scare tactic. He seems to be very level headed about our world today and it’s easy to see how the writing is on the wall for upcoming disasters. The evidence in here showing some other RV predictions that have already come to pass truly can’t be denied. The Killshot is an amazing documentary that shows the real side of Ed Dames and Remote Viewing. Why is it that so many people have a hard time believing that Remote Viewing is real? It was a top-secret military program for 20 years, was declassified and proven to work. Angry Face on the Sun? Could This Enormous Sunspot Be THE ONE? Not the five--this certainly isn't all-encompassing--but five good ones I like to keep in mind. 1. Have someone to watch your back. Last I checked, you can't grow eyes in the back of your head and you eventually need to sleep or hit the head. Or patch you up when injured. Situational awareness is big, but you've got to have someone else who you can count on to watch your six and stick with you through hell and back. Those people are often few and far between, and those relationships should be valued and cared for. Things go bad. Good situations can turn to crap in a heartbeat. Sometimes you can stand up and fight, but often times getting out of dodge is your best bet. You don't want to get stuck between the hammer and the anvil. You've got to be able to drop it all, grab and go at basically a moments notice. Have a plan and a way out of harm's way. 3. Focus on what matters first. You've got a finite amount of time/energy, so you need to work on the important stuff first. The stuff that matters the most should get your most attention and should get that attention the soonest. The other stuff can and should wait. This is a huge thing--it's all too easy to become distracted--but getting a handle on this is really important. Always good to take a moment to step back and think about the direction you're moving in. Gear breaks and the best plans fail--Murphy's Law and all that. Backups keep you alive when things go south, whether it's redundant equipment, an alternate route or contingency plans B through Z. In a time-is-life situation, you're not going to have the precious time to sit there and troubleshoot or rethink what you're doing. You've got to be able to transition quickly and aggressively to a backup plan. There's something to be said for having the right equipment, but a survivor's actual capabilities--skills and physical abilities--are what matters most. When things go bad--when there's stress, when there's pressure--then your capabilities are put to their test. If you're going to succeed, things will need to be near autopilot--don't count on having the time to think, fumble through and figure things out. You've got to be able to flip the switch and act, and that takes practice. Lots of it. What are you thoughts? Agree, disagree? What other "rules" do you prep by? The first stages of almost any type of crisis will be very chaotic. Chaos also breeds confusion and disorder. This is when an already bad situation will get worse. There will be numerous things that will need to be done quickly and efficiently if you are going to minimize the effects of a crisis. Time will become your enemy. Being organized will help you utilize your time more effectively. There is a simple saying that can guide you in becoming more organized. It’s been around a long time and many people fail to realize the value of the rather simple guidelines it sets forth. The last thing you will need to be doing in a crisis is conducting a search and recovery mission in your own home and most probably in the dark. It’s a lot simpler to designate space for needed items in advance and keep them there when not in use. You can develop the habit of going to that location to retrieve them and in a crisis your actions will become almost automatic. This will save valuable time in a crisis. Even organized chaos is preferable to the disorder and confusion that can occur if you aren’t properly organized. It can also be applied to all areas of your prepping efforts. A properly organized BOB will be more efficient in most cases, cover a wider range of needs and perhaps be somewhat lighter in many cases. A properly organized system of food storage and rotation will help to eliminate needless waste, will save you money and be vastly more efficient. An organized plan for getting all family members together in a crisis will help to minimize the confusion. The time to get organized is before a crisis happens or be prepared for the confusion and disorder that will occur. How do your organization skills “stack up”? Recently, we talked about the necessity of learning skills to aid us in a survival situation. Don’t underestimate the value of those skills for barter. If the grid goes down, people may be left with no access to medical care, serious gaps in their knowledge or the inability to repair vital items. If you possess those abilities, your skills will be in high demand. In the situation of economic collapse, there will be a revival of the barter system. 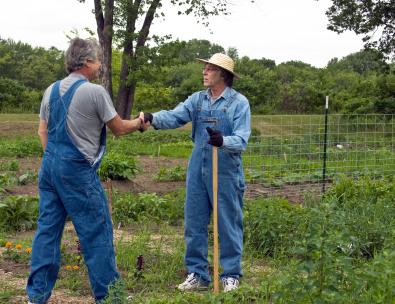 To barter means to exchange your goods or services for someone else’s goods or services. To complete a satisfactory barter transaction, each person must desire something from the other party. Despite the potential of desperation, it’s morally imperative to be fair to the party that is most in need. Remember that one day, that person who is most in need may be you. Right now, if something breaks, the replacement is only as far away as the closest Wal-Mart. However, in the event of an economic collapse or a disaster that causes the trucks to stop running, it won’t be easy to replace broken items. The ability to repair broken items will be in very high demand. It will be a rare skill, because we live in a world of planned obsolescence. Few people actually know how to repair an item in a sturdy and long-lasting way. Check out Brandon’s excellent article on the barter system here. Teaching skills to adults like knitting, gardening, machine repair, etc. Mechanic’s skills: the ability to fix solar generators, small machines, automobiles, etc. Other repair skills: the ability to repair tools, woodstoves, plumbing, etc. If the grid goes down or the economy collapses in a long-term way, gone are the days of making your living doing IT work or ringing through purchases at the grocery store. You will need to become not only self-sufficient, but a provider of goods or services. Consider what abilities and knowledge you possess that can be shared with others. Nobody can do it alone – there is always going to be something you need that you can’t provide for yourself. 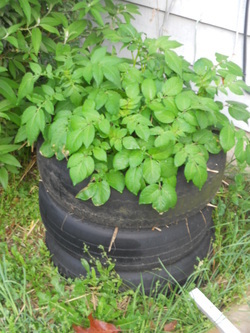 Someone asked me recently about growing potatoes in tires, and if it was a good method. It is! And so I figured I’d write about it with some details. The general idea here is that a potato plant will throw roots (potatoes) when the stalk is covered. The stalk will continue to grow as well. So if you can keep that stalk growing up, it’ll keep throwing new potato roots. You need a stack of tires, five or so should do the trick, and some seed potatoes. Cut the side wall out of one side of each tire. This becomes the top of the tire. Then add some drainage holes in the bottom side. You don’t want standing water in the tires. Put the first tire on the ground, cut-side up. Fill it most of the way full of compost or soil, and plant three or four potatoes in it. You’ll want to cut each potato into pieces with two eyes at least. Cover the seed potatoes lightly with soil, and then add straw on top. Water heavily. Once the potato plants are about two inches over the top of the straw, add another tire, and fill it with straw. Repeat until you run out of tires or decide to harvest your taters. You’ll end up with about 25-30 pounds of potatoes per stack. You can do something similar by making a three sided box out of wood. Anything will work here, but pallets work great! Instead of using tires, you just continue to add straw and a retaining board across the fourth side every time you need to add more height to your stack. Eventually you end up with a box full of straw and potatoes. What will be the first grocery store items to disappear during a SHTF scenario when all of your neighbors are rushing out to the grocery store down the street? Will the items they purchase be the items they really should be purchasing? Maybe, but then again, maybe not. For the purpose of this scenario, let’s say that the SHTF event is a major magnitude 8.0 earthquake on the New Madrid fault zone where Arkansas, Tennessee, Kentucky, and Missouri come together along the Mississippi river. The earthquake is so severe that almost all of the bridges along the Mississippi river are knocked out. Since much of the foods and supplies criss-cross the country from source to destination, there will be major disruptions in inventory when nearly all the east-west trucking has slowed to a trickle due to the major bridges being out. In this example, you don’t actually live in the devastation zone (where the power will be out and stores closed anyway), but you know that there will be serious supply shortages soon. The news media has been talking about the supply distribution breakdown and the fact that bridge repairs may take months or much longer. You are worried that food may become in short supply. Most people won’t know how bad it might get, but there will be people beginning to panic and rushing out to the grocery store to buy supplies. Many people won’t be smart, and won’t think it through. What will they buy first? Why did they buy these items? What was their ‘thinking’ or logic behind it? It’s a natural instinct to go out and buy the foods that are consumed on a regular basis, especially those that will ‘go bad’ the soonest, foods that don’t last that long like fresh bread and milk. We have been trained to think short-term. We have short attention spans and tend not to think ahead (or plan ahead). Buying milk and bread and other ‘regular’ items are Okay, but, for those who realize the serious magnitude of the situation, knowing that supplies may run out quickly and that they may be without supplies for some time afterward, what might be some better (or additional) items to buy first? Maybe some of these items will be a better choice during that last minute grocery store run before things run out completely. I’m not intending to make a list of things to get, but to point out that for a last-minute, one time last run to the grocery store while facing upcoming food shortages, you should think about it differently. By thinking in terms of getting food items that will be better for longer term shortages, you will fill your basket with other things than most people around you who are stocking up with bread and milk. The things in your basket may not be what you normally buy, but the idea is to buy the foods that will last longer, and provide more calories for you money. Remember, calories keep you alive. The most common Bug Out Bag is generally in the form of a backpack. This is mainly to afford you with an easy method of carry that leaves your hands free for other tasks and offer quick and afford easy access for the transport of the basic necessities that may be required. Thankfully, they aren’t your only option. Bug Out Bags have some drawbacks that can create problems that can be solved by using other options. These other options are inexpensive but are still effective in serving your needs. Here are just a few of the alternatives that can be used for a Bug Out Bag. 1. Bug Out Bucket - Buckets are very versatile items that can be found rather easily for free or at an inexpensive price. They can hold a significant amount of items but also work to limit the weight factor and generally can offer extended protection for your bug out gear items. One of the major drawbacks of a backpack is that people generally tend to over pack their BOB’s until they are almost too heavy to carry any distance and if they sit around for an extended period of time don’t offer significant protection from pests or moisture. A bucket is not going to give much, no matter how hard you try to stuff items into it. Yet it still offers significant protection for your gear and generally will have a handle as well. It can also serve a number of secondary purposes such as a means to carry water from a remote source. 2. Bug Out Box - A simple cardboard box can also be used instead of a Bug Out Bag. They are extremely tough, inexpensive and come in a large variety of sizes. While it may not offer a comparable level of protection as a bucket, it is a very frugal alternative. A small to medium size box will put some limitations on what you can carry but this only helps you to keep the weight factor down. They are also easily stored and stacked. If your budget allows, you could even use plastic storage bins as a cheap alternative. 3. Bug Out Blanket - Even a simple blanket when made into a swag will offer you a cheap alternative for use as a Bug Out Bag. In fact, you could use just about any type of material you have available. If you’re looking for a little protection from moisture for your gear, you could easily use an old shower curtain tied off with some paracord to make a bindle, especially if you needed to bug out in a hurry. In a survival situation, it’s important not to place arbitrary limits on how you seek to accomplish things. It’s important to focus on your immediate goals and use whatever means and resources that are available to your advantage. You will need every advantage you can get in a survival situation.